It’s October 3rd. That means you have approximately 24 days to find a Halloween costume. I know what you are thinking – this girl can’t add. I can. The countdown is on to October 27th when most people will be hosting Halloween parties since the holiday falls on a Wednesday. I say most people. College kids will likely booooze on the 31st (those were the days). Each year I produce a list of Halloween costume suggestions – most based on pop culture. I started this because my friends always ask me for ideas on what they can be (in fact, I’ve already received three requests for costumes). So here it is! Feel free to add any super ideas that you’ve seen to the comment section. · New Jersey Tanning Mom (1) – When I saw this lady on The Today Show earlier this year, I said “This would make a perfect Halloween costume” (see below). To pull off this, think orange makeup and/or a LOT of bronzer. I like her leather jacket look. Maybe add a baby doll that is super bronze too. · Prince Harry (2) – This suggestion came from Shot of Mom after the Prince’s Las Vegas party pictures were released. Pull this off my making a bachelorette party shirt on Zazzle (see above), red hair and just get WASTED. · Gangham Style (3) – Another Shot of Mom suggestion, dress as the YouTube sensation with tuxedo-wear (girls, think Jenelle Monet), sunglasses and your iPod playing his song on repeat. · Team USA (4) – A good group suggestion, go as the Fierce Five gymnasts, basketball dream team or Phelps + Lochte (4). Think red, white and blue attire (leotards, swinsuits), gold medals, etc. · NFL Refs on Lockout – There are a few ways you can pull this off. Go for the traditional ref outfit and add vacation accessories (lei, sunglasses, golf clubs). OR you can be a replacement ref by looking discombobulated! · Honey Boo Boo + June (5) – America’s favorite reality show family of the moment, I expect this to be a popular couples costume with the guy opting to be June (the mom). · Magic Mike (6) – Based on the popularity of the movie among women, this could be good for a group of guys. · Goyte (7) – So this is a weird, wild card kinda costume, but if you watch the VH-1 countdown by me, you will remember this weird video. To pull this off, you need to go body paint. I get a lot of requests for couples and groups. Here are some things that I’ve seen on the internets over the last year. · Beanie Babies – Saw this on Pinterest and immediately loved this 90’s throwback. 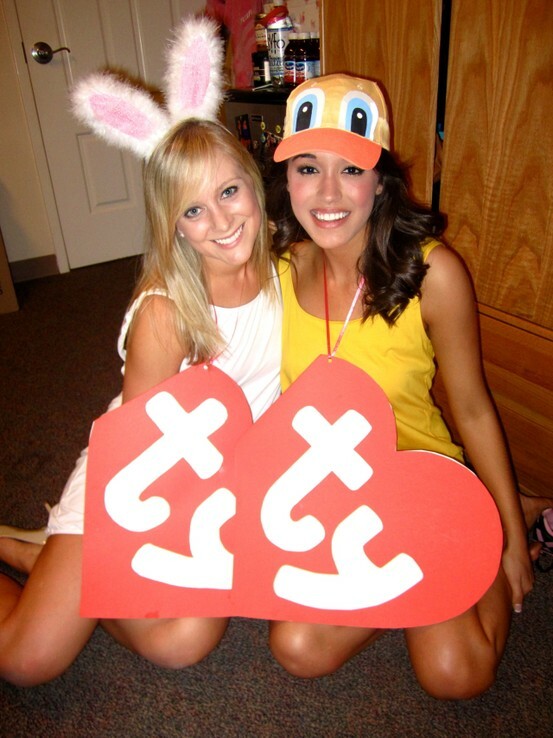 Dress as an animal with a big TY heart tag on your neck. Bonus points for including the animals name on the other side of the tag! · Sesame Street – Loyal readers know that I dislike slutty just to be slutty, but I think you can do this tastefully and with boas! A new feature this year, I wanted to list a few things that have been done too many times. Unless you are going super big with one of these, keep it at home. Have Mercy! Full House turns 25!